Since finding out you can pay on the door, (yay) I'm much more relaxed about these entries. I thought i'd post progress, I do expect to finish in time, as I feel I've got a handle on them now. I'd still really appreciate any feedback. 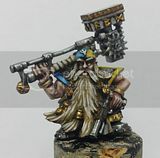 I took these pictures because in the main I've found that taking pics for this blog really helps me to see the miniatures in a different way and the flaws are hugely magnified, it helps me improve. and hey, if I've taken them, it's like a law that I blog them, right? so the first thing that happened was to the base, it snowed. Here's the progress on the big gun, not inspiring, but at least I haven't messed it up yet. I'm quite happy with the progress on the guys, the melta gunner is getting all the paint first so if I screw up it's with him not the other guy. They both need a detail pass and they need extreme highlight and shadow, after that I'll add some weathering. please let me know what you all think. Good luck, see you there. Looking good so far. I'd say snow in the trench but not in the well travelled portions. That base for the meltagunner is fething sweet. They're still pretty WIP, but I'd also say you have a very solid foundation on the DK minis. Stay focused and good luck! Thanks guys, killer day at work so no new updates sadly. still if i have to finish it all on saturday i'm okay with that. Well, I haven't made it to GD, my missus has a stinking cold and I've got way too much work to do. I'm nearly done with the figs though so I'll post them once they are finished, and I think i'll try and find a few local, smaller things to enter my guys into.